Conley, the CEO and founder of Joie de Vivre Hospitality, turned to psychologist Abraham Maslow’s iconic Hierarchy of Needs. This book explores how Conley’s company "the second largest boutique hotelier in the world" overcame the storm that hit the travel industry by applying Maslow’s theory to what Conley identifies as the key Relationship Truths in business with Employees, Customers and Investors. To be honest, the essence of the book is in the first chapter. The other chapters are endless variations and illustrations of the same with rather simplistic, naive, and even romantic examples. Maslow studied mentally healthy individuals instead of people with serious psychological issues. This enabled him to discover that people experience “peak experiences,”high points in life, when the individual is harmony with himself and his surroundings. 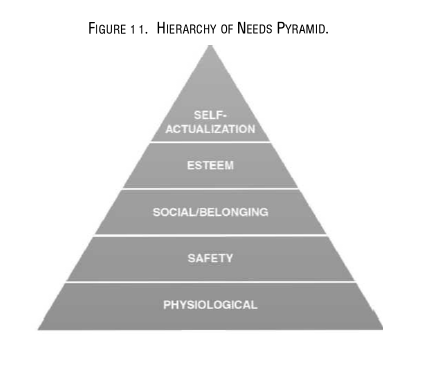 A visual aid Maslow created to explain his theory, which he called the Hierarchy of Needs, is a pyramid depicting the levels of human needs, psychological and physical. When a human being ascends the steps of the pyramid he reaches self actualization. Maslow for dummies is summarized in the table below (all tables below come from Chip Conley’s “Peak” book). Conley may be over-simplifying, as he reduces Maslow’s five layers to three. 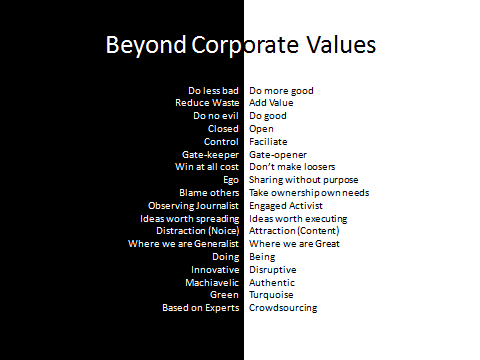 But in the end, i found this an interesting way to assess and improves a company’s stakeholder relations. Chris Conley basically says that most companies offer a salary and perks in compensation for the employee’s time. 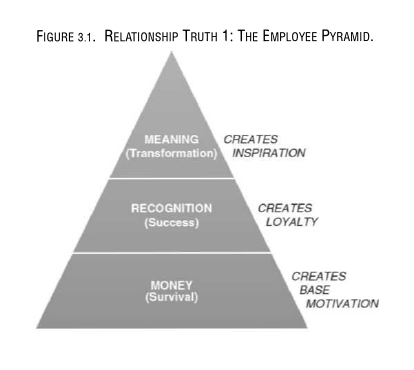 Fewer companies succeed in giving true recognition to their staff, and only a very few know that their company should shape the conditions for the employee to find meaning in his work. The same principles apply to the customer pyramid. At the top, the customer is truly delighted. Not because you got a “”license to operate” (btw the minimum level pursued in the Lean “Kano” model, but because you address unrecognized needs. You will NOT identify those unrecognized needs through customer surveys, consultations or market research. And the risk exists - if your organization has been “leaned” to offer in a scalable way the “license to kill” satisfaction – that you won’t have any resources left to try to “create evangelism” by your customers. 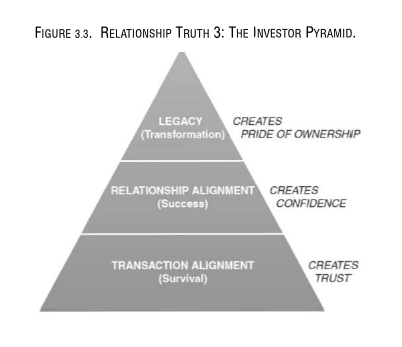 When we look at the relation with the investors, most companies are transaction oriented in their Shareholder’s Relations: when they assess the relation, they ask whether the Board member gets regular and sufficient information or whether the dining and site-seeing arrangements are to everybody’s satisfaction. However, the ultimate nirvana in Investor relations is that your investors are PROUD of being your investor. This is much more than “being treated well”. It’s much more that just being a happy shareholder, or somebody who would recommend doing business with you. Reaching the top-levels for each of the three categories of stakeholders is already an unreachable dream for many organizations. However, shareholder relations should aim for an even higher goal. Anybody who has been reading Maslow, should be familiar with Richard Barrett. Chip Conley missed that opportunity. One of the best books to get familiar with the thinking of Barrett, i can recommend “Building a Values-Driven Organization: A Whole System Approach to Cultural Transformation”. In essence Barrett is saying that Maslow levels focus on our personal self-interest – meeting the needs of the ego. 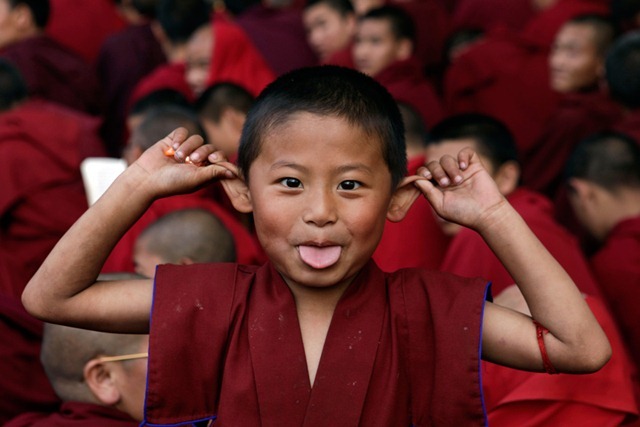 Barrett’s levels beyond transformation are about being ego-less, at the service of others. The fears of the ego lead us to believe that we do not have enough of what we need. Consequently, we are never fully happy because we do not have enough money, we do not have enough love, and we do not have enough respect. In this situation, we lead a dependency-based existence. 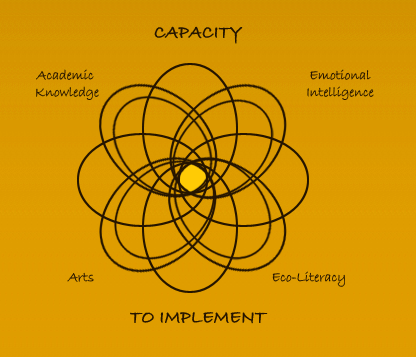 What if we would apply these upper-levels from Barrett to our Stakeholders Relations ambitions ? Do you have the courage to assess your stakeholder relations based on the Maslow of the Barrett models ? What would you change in your shareholder relations if you would just aim for one higher level then where you are today ? It’s becoming a trend/pattern: today’s business is not anymore about transactional and technical readiness. The more important under stream is to develop and execute a solid stakeholders architecture. It’s about an openness and transparency. Often Social Media tools are used to support such strategy and ambition. But they are just tools. They are worthless and only become “tricks for the quick fix” in the absence of a genuine stakeholders architecture. In the end, our new-game economy is about doing good, giving meaning, and realizing your relationships. The level of ambition will define how innovative your company wants to be. No ambitions leads to no innovation or incremental improvements at best. Ambition will force you to look into other corners, will let you discover how you truly can redefine your marketplace and change the game. Ambition will lead to radical innovation: in your products, services, and in your stakeholder relations. So, what’s your ambition ? Flyfire swarm for U2 ? Re-think big screens. Really big screens in the sky. Think swarms. MIT’s Flyfire project uses a swarm of miniature helicopters with embedded LED lights to act as ’smart pixels’ as they fly through the air. Acting in concert they will be able to form complex three dimensional shapes – digital displays that will awe you more than exploding chemicals ever could. Not only will the pixels change color, the 3D dynamic movement will create an immersive experience that you can view from any angle. I was just reading a Trends Magazine article about the new CEO of Barco, once – and to be honest still – of the pearls of the Flemish tech industry. Have a look at their history here. They started in 1934 as a company specializing in the assembly of radios with parts from the United States. Hence the name, "Belgian American Radio Corporation" or Barco. Imagine Barco implementing this new MIT Flyswarm technology and scale it so that it can be used as a massive projection-in-the-sky for the next U2-tour ! 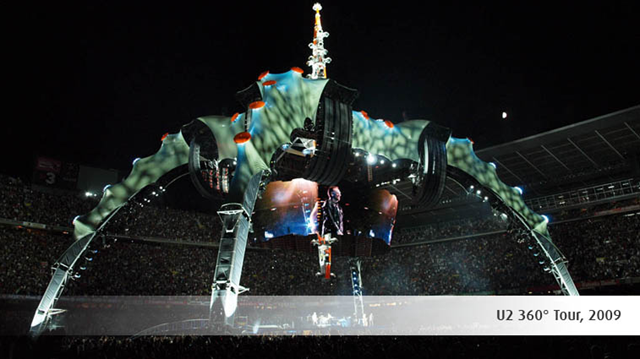 Miniature helicopters turning the U2-sky into a Digital Screen. There was this week a really interesting article in Trends Magazine about “The Blue Economy”, about a guy called Gunter Pauli, and his ZERI foundation. I started googling this stuff, and was amazed about what i found. Apparently, Gunter Pauli is busy doing what he does for quite some time, as can be seen in the Fastcompany article dating back 1993 ! Surprise, surprise: Gunter is from Flanders, Belgium. He was co-founder of Ecover. In 1991, Pauli launched the concept of zero waste and zero emissions for industry through the clustering of activities at his detergent factory in Belgium. Gunter Pauli is Member of the Club of Rome, a Fellow of the World Academy of Arts and Sciences, a Creative Fellow of the Club of Budapest and a long term advisor to the Japanese Government and the United Nations. He is professor at the Politecnico di Torino in charge of “systems design” at the Faculty of Architecture and the School of Design. “The Blue Economy: Cultivating a New Business Model for a Time of Crisis” is based on the new book “The Blue Economy: 10 years, 100 Innovations. 100 Million Jobs”, published by Paradigm Publications (New Mexico, USA) with the support of UNEP and IUCN. I could not yet find the book on Amazon, but the paper that was input to the Club of Rome can be downloaded here. The form of capitalism that has dominated world societies is entirely disconnected from peoples’ real needs. Some two billion people struggle to get by on less than two dollars a day, lacking access to food, water, health, and energy, the most basic requirements for survival. Over 25% of the world’s youth are unemployed. Yet one billion of us are over nourished and swim in 400 million tons of electronic waste with higher metal concentrations than the ores extracted from the earth. Conservatively, the top 70% of the world’s wealth is concentrated in the top 10% of the population. a global network of creative minds seeking solutions to world challenges. The common vision shared by the members of the ZERI family is to view waste as resource and seek solutions using nature’s design principles as inspiration. This is about an innovative learning project for children, developed by Gunter Pauli and a team from ZERI Network of scientists, scholars, pedagogues and artists. It’s about learning children to ask the right questions. Also check-out this fantastic talk "How Can We Use Finite Resources To Propel Ourselves In The Future?" of TEDxTokyo 2009, held on May 22 at National Museum of Emerging Science and Innovation. It all makes me think very much about the book “Cradle to Cradle” by William McDonough (Author), Michael Braungart (Author), a book that was a real eye-opener for me at the time, and a book that i already mentioned several times in this blog. “Let the future emerge” is the tagline for this blog. And things seem to emerge with an astounding sense for synchronicity. Just last week, i discovered The Fifth Conference. The Fifth Conference is a forum for vision. Part publisher and part conference, The Fifth Conference tackles the ‘big issues’, the factors that drive our future. Think ten, twenty, even fifty years ahead and try to imagine how we will live and work. What will this world look like? How will we have solved the economic, social and environmental challenges that we confront today? To answer those questions we talk to entrepreneurs, policy makers and experts. We analyse the facts, the forecasts and the arguments. And most importantly, we collect vision. It is so close to my idea of the Think Tank for Long Term Future ! So, last week, i had a chat with Frank Boermeester, co-founder of The Fifth Conference. Frank invited me to draft an essay on Technology, with a focus on Technology Readiness in our region, for the next publication. Will certainly do so, and cross-post on this blog. that is driving all the changes and evolutions in Growth, Mobility, Green, Technology, Health. Its about the theme of Cradle-to-Cradle that “reducing waste” is not good enough anymore, we need to “add value”. Its about the notion that Google’s “Don’t do evil” is not good enough anymore, and we need to “Do Good”. and yes, create a sustainable society. Thought experiment: who am i really ? About a year ago, I did my “coming-out” of the Leading by Being program. That program led to the start of this blog in April 2009. Leading by Being is in essence a deep search for yourself and how you function in groups and in the world in general. It’s trying to answer the question “Who am I ?”. What if i would loose not only my foot but everything ? Would that change who i am ? in my blog as today ? with the same intensity ? The answer for me is yes. Probably much much more about the realness of innovation. Probably about my daughter and my wife. Without compromising them. Probably about some nice sentences i read in novels. In essence, it’s about a free mind. I would be more radical on the innovation themes. Yes, even more radical 😉 I feel i still withhold, because of – real or imaginary ? – fear for reactions of my employer. I would set-up the Think Tank Long Term Future on my own. With less dependency on others. Going my own way. I would look at setting up a open innovation web-site with online fund raising. 1) Fear of Losing the Business – No service provider wants to lose clients or revenue. Interestingly, it is this very notion that prevents many service providers from having the difficult conversations that actually build greater loyalty and trust. Clients want to know that their service providers are more interested in helping succeed in business than protecting their revenue source. 2) Fear of Being Embarrassed – This fear is rooted in pride. No one likes to publicly make mistakes, endure scrutiny or be embarrassed. Naked service providers are willing to ask questions and make suggestions even if those questions and suggestions turn out to be laughably wrong. Clients trust naked service providers because they know that they will not hold back their ideas, hide their mistakes, or edit themselves to save face. 3) Fear of Being Inferior – Similar to the previous fear, this one is rooted in ego. Fear of being inferior is not about being intellectually wrong (as in Fear of being Embarrassed) it is about preserving social standing with the client. Naked service providers are able to overcome the need to feel important in the eyes of their client and basically do whatever a client needs to help the client improve – even if that calls for the service provider to be overlooked or temporarily looked down upon. The last one is in my opinion also related to your relation with your employer and how prepared you are to stick out your neck, and to evangelize your ideas, because you have a genuine desire to make your employer succeed and improve. The worst than could happen is when your employer gives you a negative appraisal for sticking out your neck, or pushing change too hard. Especially if you are part of the innovation team. Though everybody in the company has creative juices and is an innovator. And what do you do when this happens ? What do you do when you discover that the innovation your company proclaims is not real ? What do you do when you find out or get confirmed it’s all a big illusion ? How much do you once again want to compromise your own authenticity and just go on ? Or are you prepared to go through the resistance of big changes and boldly daring to pursue your own dreams as suggested in Seth Godin’s Linchpin ? Or how long are you prepared to you hide in your own shadows and have your will broken ? In Leading by Being, one of the exercises was to think about one of your “shadow”-sides, some negative something about yourself, something that you would not like others to identify you with, such as being arrogant or manipulative or … and then the do a play-role yourself “playing” / “acting” that shadow role for 3 hours. It’s pretty confrontational ! to express those shadow thoughts ? It’s an interesting thought experiment that helps you assess how Trapped or Free your are in your worldviews. What would you like me to explore further ? What different things would you like most ? Where would you like to see a different intensity ? Let me know. Give me clarifying, supportive and challenging feedback. Interesting blog post from James Gardner in Bankersvision a couple of days ago. Formerly Head of Innovation and CIO of Investment at Lloyds Banking Group in London, James Gardner is now Chief Technology Officer at the Department for Work and Pensions in the UK Government. James has also written “Innovation and the Future Proof Bank”, a book that is on top of the pile of to-read books next to my “broken-foot-sofa”. What are your thoughts on organizations were failure maybe is not an option. For example nuclear physics, NASA or a government organization that pays benefits. In these situations failure could be disastrous. What strategy would you recommend in these types of organizations? James adds an interesting perspective: failure early in your project is better then close to delivery. …the further you get into delivery, the more money you’ve spent. If you have to stop then, its very bad indeed. As innovators, you don’t want that situation occurring if you can help it. It leads to what academics call “innovation trauma” – the scenario where everyone is so burned by a failed innovation that no-one will ever sign up for anything new again. Even one bad failure, though, can close down an innovation program. And clearly, in the cases that Malcolm mentions, that kind of failure has very dire consequences indeed. One last point on this: “failure is not an option” is a mentality that leads to – you guessed it – failure. Trying new things is a process that requires lots of stops and starts. There will, inevitably, be more stops than starts, actually. In an organization that doesn’t celebrate good failure, what you get is a scenario where nothing new starts at all. It’s also via this post i discovered James Gardner’s “The Little Innovation Book”. This little on-line experiment has absolutely great content for innovators. Every page adds a perspective to innovation that i was not familiar with. A recommendation. You can also comment on-line as James is writing this on-line innovation book. 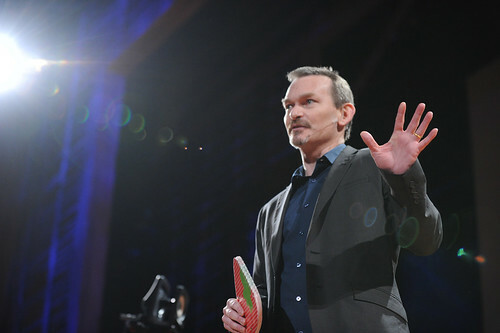 Would you be interested to have James Gardner at Innotribe @ Sibos 2010 in Amsterdam (25-29 October 2010) ? Let me know. We can invite him 😉 But would he accept ? Umair Hague did it again. He just published the Great to Good Manifesto. He starts with “Pepsi‘s great at producing something that’s bad for you (sugar water)”. And goes on by stating that “Do no evil” “Don’t do evil” is not the same as “Doing Good”. Umair’s blog is in essence about an Ethical Re-Boot. We all feel that we cannot go on with the greed-economy. We cannot go on with killing our earth. We cannot go on with hurting other people. It is about a new value kit for the 21st century. About old game vs. new game. In the table below, you’ll find some other examples. There is a better alternative, and that is producing products that do not generate (less) waste, but that add value, that add goodness. This is the essence of Great to Good. The difference between “Do no evil” “Don’t do evil” and “Doing good”. In that sense, also the famous TED one-liner “Ideas Worth Spreading” is not good-enough anymore. Better is “Ideas Worth Executing”. How many of the principles are at work in your company, industry, or sector? What would your company, country, or life look like if each of the principles was applied to it? 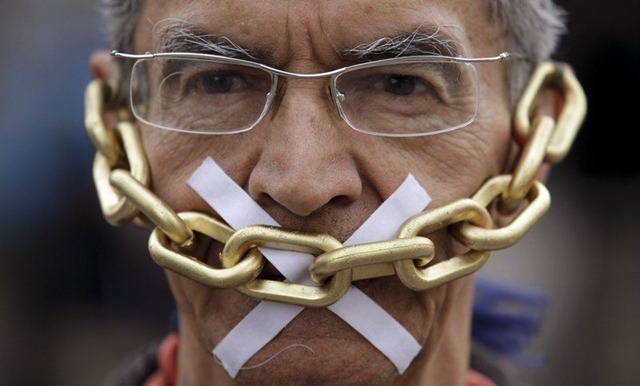 How would applying each principle disrupt “business as usual”? is all what our Think Tank on Long Term Future is about.